West Point cadets watch the Army-Navy football game hosted at the M&T Bank Stadium in Baltimore, Maryland, on December 10, 2016. About 747 people reported experiencing unwanted sexual contact during the 2017-2018 academic year, up from 507 in 2016-2017. 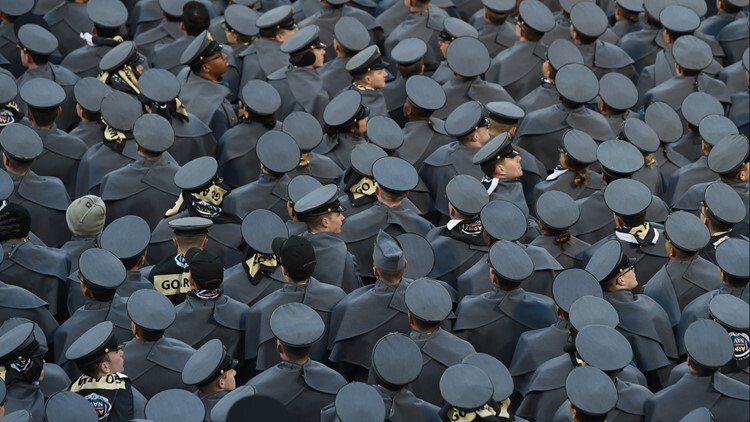 Reports of sexual assault spiked nearly 50 percent at military academies during the past year, even as leadership worked to raise awareness, according to a Department of Defense report released Thursday. About 747 cadets and midshipmen reported experiencing unwanted sexual contact during the 2017-2018 academic year at the U.S. Military Academy, U.S. Air Force Academy and U.S. Naval Academy. That was up from the 507 in the 2016-2017 academic year. Unwanted sexual contact included unwanted touching of “genitalia, buttocks, breasts, or inner thighs when the victim did not or could not consent,” according to the report. Another alarming finding: 50 percent of women and 16 percent of men said they experienced harassment in the previous year – an increase for both groups. There were also five more reports of sexual assault, with 117 people saying they were assaulted in 2018. The spike comes as the military has focused on the goal of reducing, and eventually eliminating, sexual assault at its academies. “This year's report demonstrates that there is more work to be done to meet this goal,” said Hon. James Steward, who performs the duties of undersecretary of defense for personnel and readiness, in a statement. In the summer of 2018, the academies implemented plans to encourage responsible alcohol use, focus on prevention, improve reporting and teach about healthy relationships, among other initiatives, the report said. “While we are disheartened that the strategies we have employed have not achieved the results we had intended, we are not deterred,” said Dr. Elizabeth Van Winkle, executive director of the office of force resiliency for the undersecretary of defense for personnel and readiness, in a statement.